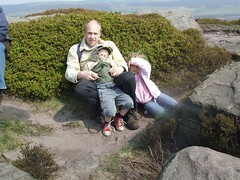 Today we went for a walk on The Roaches. The five of us, together with my parents, my sister and my nieces walked from Roaches Gate to the highest point, although my Mum, sister, Chloe and Imogen turned back early because the wind was incredibly strong. I've put the route we walked on My Google Maps together with some photos and a link to the Flickr photo set.